Bizzie the Bee is busy trying to meet his pollen quota. Click here to play! He needs your help in organizing the workers to get the golden dust back to the hive and made into honey. If you successfully help Bizzie, you might just find yourself rolling in your own golden fortune. The Workers are key in accomplishing Bizzie's goal. If you're lucky enough to spin one to four of these little guys and you'll win up to 5000 times your original line bet. These worker bees also double the prizes when they appear in winning combinations. Spinning two or more queens will get you 1000 times your line bet. Flowers are invaluable to Bizzie and two or more will pay out 500 times your bet. 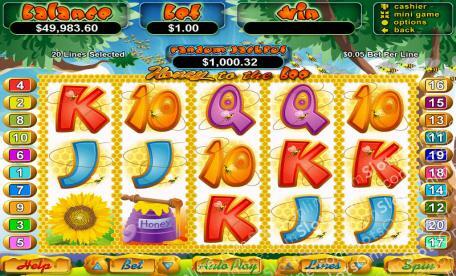 Honey pots and lady bugs also help out, each paying out 300 times your bet. Bizzie seems to get the most work done in the free games as prizes are doubled during this feature. To trigger the free game feature, spin one or more worker bees anywhere on the board with a Hive on reel 5. Bizzie needs your help to make his honey. Help Bizzie tonight and you're likely to walk away with some extra honey of your own. Two or more Hives anywhere on the board will pay out up to 100 times your bet. A bonus feature will activate if you spin one or more worker bees along with a hive on reel 5. Players will be rewarded 15 free games. During these games, prizes are doubled. The fuzzy little Worker Bee will substitute for all other symbols excluding the scatters. These bees only appear on reels 1, 2, 3 or 4 If one or more of these little guys appear in a winning combination, the prize will double.